It's all about maintaining a steady spead. My friend told me a tale of a guy in Brixton who has pimped up his push bike with a massive stereo system. This, I think, is funny. Especially since the guy who modified his bike probably doesn't realise that it's funny. My bike however will be cooler. This bike has a great big vinyl record over the front wheel covering the spokes - like those no-spoke wheels that kids loved in the eighties - and a needle hovers over it. Where the basket should be there is a bronze gramophone horn. The faster you travel the quicker the track will play. It's all about maintaining a steady speed. I'd definitely put Queen on it first. I actually do want to ride my bicycle, I want to ride it where I like. I had a bike that played whale song when I put the brakes on, does that count? In the late 80's I once kitted out a bicycle with a CB radio from a car. This would be fun over potholes, it would add to the realism. For a more sinister touch could the needle mechanism be made to move from the inside out, playing the music backwards? [hippo], was that for any reason? Going on a cross country bike ride in treacherous landscapes for instance? When can I buy one? I suppose those downhill glides will make the singers sound like chipmunks. Wouldn't it be "Vincycle" or "Vicycle"? Yup. Despite spelling vinyl correctly elsewhere in the idea I forgot the 'y' is at the end. Changed. Cheers chappy. I was also thinking that maintaining a steady speed isn't necessarily a necessity. Like you say [adjective], the faster and more frenetic you travel, the faster and more frenetic the music will be, perfectly suited to your current state of mind, panic, as you hurtle down a hill. Similarly, ambling around or slowly coming to a halt will produce that deep, lazy throaty sound. I'd play Flight of the Bumblebee down a steep hill. Or the Sailor's Hornpipe on an increasing incline. This could be done "music-box" style, too. The disc wheel would have little nubs that, upon passing the front fork tube, would pluck metal tabs attached along the length of the fork tube, each one tuned to a particular note (see link "music box"). In any case, I love and bun the idea heartily. Nice [danielo], I like it, but every time you cycle through a neighbourhood you'd have the overwhelming urge to sell ice creams. Yes, well, the original idea was going to be an exploration into what a man's predicted Basal Energy Expenditure at music festivals might be, say for instance the Jazz Appreciation Month, incorporating molecular dynamics simulation and the Vicycle itself as my second and third variables, but in the end I opted just to take spead instead. Experienced Vicycle Jockeys could have a vertical deck installed on the back wheel as well, with cross-faders on the handle bars allowing the more talented riders to mix from one wheely good tune to another. Playing records at 33 1/3 rpm while cycling a 26" wheel equates to a speed of about 2722 inches per minute or about 2.5 mph. It's actually quite hard to cycle this slowly - therefore can I suggest this product is based around singles and 12" EPs (45rpm, or about 3.5mph) or even better, old shellac 78's (78rpm, or 6mph)? The low speed is conquerable: the wheel is, in fact, a large CD. Now, a CD turns at 500rpm when the pickup is at the center, about 200 at the edge. If we assume the bike is going to roll at 500rpm, that's 38+mph - one side, Armstrong! But the rim speed of a CD at 200rpm is about 3100 inches per minute, or just a hair under 3 mph - that's the speed the pickup wants. That's still too slow. I can do it, but I want to GET somewhere, too. Today. Instead there are several pickups and a bit cache that allows the data to feed in at the correct rate - if the bike's moving too slowly, two or more pickups gather the music off the platter simulataneously, and software assembles it from the cache, not too dissimilar from the function of the anti-jog memory in a lot of personal CD players. //200rpm is about 3100 inches per minute, or just a hair under 3 mph// - I think you might have made an error in this calculation. No, I'm sure it's not. But I'd still like to hear it. My email is on the old profile page if you change your mind. 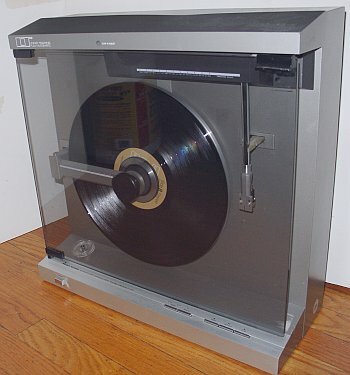 How about a spinner wheel, where the wheel only engages and drives the record when the record spins slower than the predetermined record RPM. Weight the outside of the rim and you'll essentially have a flywheel that keeps the record playing when you're stopped waiting to cross traffic. CD speed (when the pickup is at the outer track)= 200rpm (according to Wikipedia), rim diameter is 5", 200 x 5 x 3.14 = 3141 inches per minute. 3141 inches / 12 inches per foot = 261.75 feet per minute or .049 miles per minute: just under three miles per hour. It would be quite simple, I would have thought, to gear the vinyl to increase and decrease in speed at a rate higher than the wheel's acceleration and decelleration. This could also be done discreetly making the final product look like it's spinning at the same rate, whilst producing a more rider friendly playing speed. You asked earlier  about vinyl toughness against road vibration and bumps etc. The wheel isn't itself made of vinyl, the wheel still has spokes as its core frame but the vinyl is placed over it, resulting in a marginally wider wheel, but with the spokes obscured from view. Clamps and such forth will keep the needle steady against the record. if you had records on both wheels, will that make it stereo? Simple, make the CD be the standard 5" size, and have standard 26" wheels. 3 mph becomes 15, a nice comfortable ride. Surely you're not going to ride along on 5" wheels? 'Stuck in a mome, Stuck in a mome, Stuck in a mome' Shirley. Would it would work better with a Penny Farthing? Only if you could find some old 78s. I see this circling in front of Buckingham Palace, playing God Save the Queen.